The HappyFeet Charlotte Area Youth Soccer League is an excellent opportunity to see your little one further develop and showcase his/her HappyFeet soccer skills. Our best in class engaging youth league curriculum maximizes fun, friendship and development to ensure your child always wants to come back! We have found that parents & grandparents enjoy the league program as much as the kids! A great alternative to traditional charlotte recreational soccer leagues. Each session is led by our quality trained soccer coaches in Charlotte and follows our unique expert-approved aged appropriate curriculum which is designed to maximize fun and development. HappyFeet kids learn to manipulate and control the ball, improve balance and coordination, and be brave, creative leaders as they express themselves on the field with skills like the Maradona, pull backs, scissors, Ronaldo chops, stop bobs, and more! Each soccer league game is preceded by a 15-minute HappyFeet "Mini Class". During the "Mini Class," your child will enjoy many dribbling and ball striking touches to prepare them for the soccer league game. The league game immediately follows the "Mini Class" and is 30 minutes in length. During the games your child is encouraged to try new skills, take risks, and be brave at every opportunity by our caring team of coaches. The HappyFeet Charlotte Soccer League is played on the weekends. It is offered for all children ages 2.5-8 (Preschool-Kindergarten / 1st grade). The kids are grouped with their friends in teams of similar ages from the same school. This is the perfect way to make team play great fun and introduce kids to organized team sports. 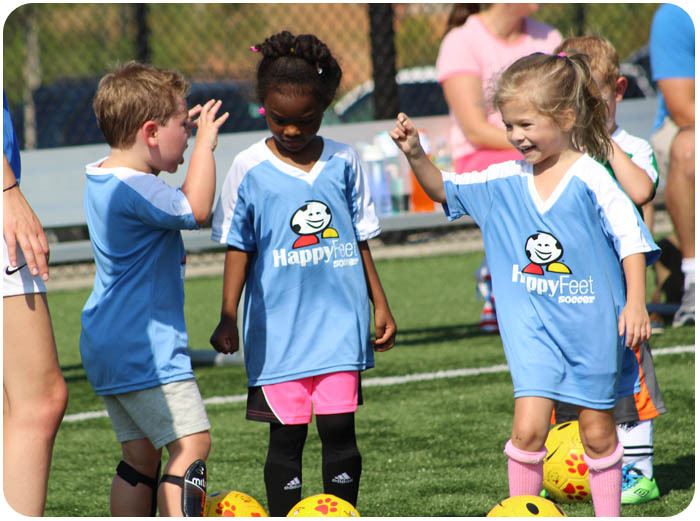 They have a blast because they’re familiar with their HappyFeet Charlotte soccer coach, the HappyFeet approach that teaches important skills and their friends from school! HappyFeet leagues are one of the best toddler activities and soccer programs for young adolescents in Mecklenburg, Union, Lancaster and York counties.